Oh dear … what can this be? I first removed a few leaves from a Camellia plant a few days ago that looked like this. Situated pretty much at the bottom of the plant I removed the branch with the affected leaves, threw it away and thought no more of it until I found a second branch yesterday with the same thing. I decided to take some photos and once I looked at them on my computer I realised that its a lot yukkier than I first realised. UPDATE TO THIS POST – Have just found MORE leaves on the shrub towards the top part also covered in this. Looks newly infected/affected, but now I am extremely perturbed and hope someone can help me ID this. I’ve looked on the Internet and all I could find was one other person displaying a similar image asking the same question. What is this? I’m thinking it might be fungal, because it seems to have some wet areas (more obvious in the below enlarged versions). The plant is located in a shaded position, looks very lush and healthy, except for these two branches, which were located towards the bottom of the plant. There has been no leaf drop, the stem looks good … all in all the plant looks great. If anyone has any knowledge or experience in dealing with this I’d be so grateful for your input. Ewe! That looks bad! 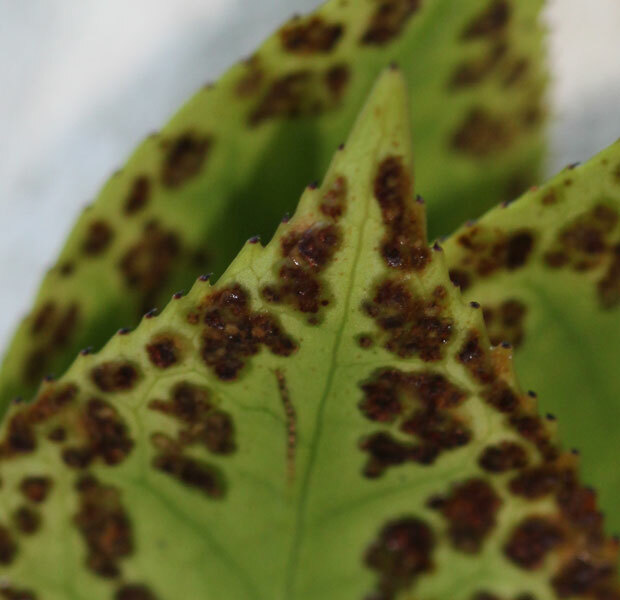 Interesting about the oedema – never thought that could happen in plants! When I see you tomorrow, remind me to take a leaf so I can look under the microscope! If there is anything sinister lurking in there, I’ll see it! Christine, I found a document from one of our Cooperative Extension offices. From what I have read it sounds as though your camellia could be suffering from edema (sometimes spelled oedema) – I would like to send you the document, but how? The text reads: “a disorder of camellia leaves due to excessive water uptake by the roots and a reduced ability of the foliage to transpire this buildup of water. The symptoms will first appear on the bottom of the leaf as small, water-soaked, raised areas. 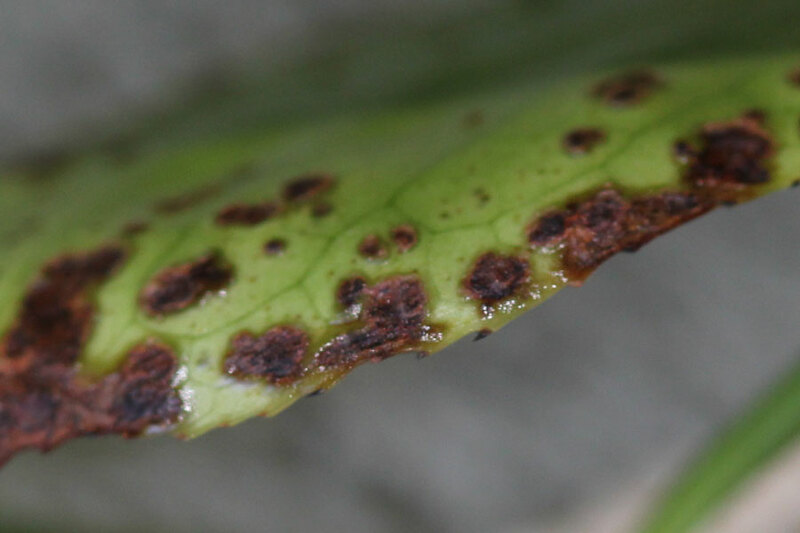 As the water pressure builds up in the leaf tissue, blisters will form. They will be rust to yellow in color and will show up on the top of the leaf. Edema typically occurs in late winter or early spring following wet, cool weather. With the cool temperatures, extended cloudy weather and higher relative humidity, camellia plants will take up much more water than they can transpire. Edema can make the plant look bad, but does very little damage. 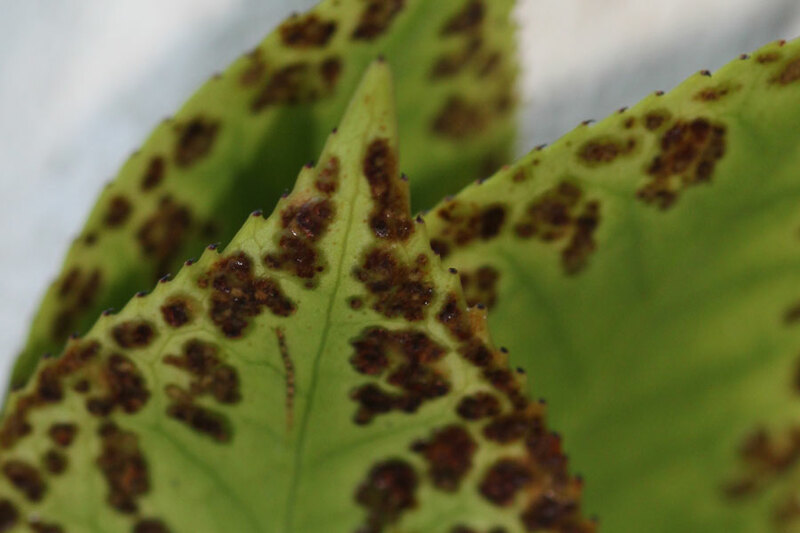 In addition to camellias, this condition occurs on several other landscape plants, such as English ivy, fatshedera, ligustrum, rhododendron and jasmine. Hi Debra – This sounds about right – Thank you for the info. I’d really like to read the document, my e-mail address is christine@thegardeningblog.co.za – I would really appreciate it. What you have said above all rings true – and I’m relieved it won’t kill the plant. I had the big tree that shades it pruned back yesterday (had grown a bit out of control again) and I will prune back the Nandina that is crowding it today. Will check irrigation, cut off the rest of the affected leaves/branches and then see what happens. The pdf document is on its way to you, Christine. Good luck! I have sent a link to your blog to our local camellia expert and am awaiting a response (or maybe he will comment). Will let you know. It rained here for the proverbial 40 days and 40 nights from August to October breaking all kinds of records. My daphnes all died from too much water, but absolutely nothing happened to the camellias. Oh Wow Carolyn, that is very kind and generous of you. I would so appreciate any help, this is my oldest and favourite Camellia and I would hate to lose it. Is this a Camellia japonica? I’m struck by how regular these spots appear to be at the leaf margin. I used to grow lots of Camellia japonica, but have never seen anything quite like this. Camellia edema (oedema) is similar in appearance, but tends to be more irregular looking. How has your weather been recently, rainy? It could also be a bacterial leaf spot. Regardless, I suspect the root of the condition is excessive moisture/poor drainage. I agree with Alan, drop a sample by your local nursery, and see if they have seen this before. Good luck! I hope you’ll update once you get a diagnosis, I’m curious! It doesn’t seem to be one of the common Camellia issues based on the Google search I just did, so maybe it’s not something specific to that genus (which is probably good news). Take a leaf to local garden centers in a sealed plastic bag and see if they have any ideas. 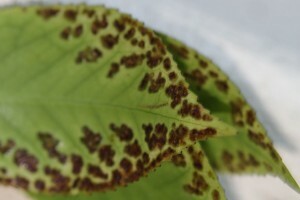 If there are some leaves that just have a tiny bit of this, maybe try spraying them with neem oil and see if it helps. I wouldn’t spray more than a couple of leaves though. Hi Alan, thanks, I’m going to take your advice and take a branch to the nursery. If they can’t ID it, they can, I’m sure, give me something to treat it with. If they can’t ID it, I wouldn’t trust their judgement on the cure. Ok! Thanks for the warning! If they can’t tell me what it is I’ll just get neem oil.